At this moment, right now, you have everything you need to build a successful business. But you’ve got to find a way to tap into it. To use it appropriately. To unlock all that potential that’s sitting inside of you. It’s like with your smartphone. I’ve had an iPhone for years, and I KNOW it can do so much more than what I’m using it for. But I have yet to tap into the full power of what this device can do for me. The only way to unleash the full force of the power that lives inside of you is to get your mind right. Otherwise, you’ll be this beautiful, amazing, ball of potential that doesn’t live up to what you are capable of achieving. That’s a sad, sad, tale. This post will serve as a tune-up for your mind, so you can more effectively tend to the very important work of building a business that thrives. 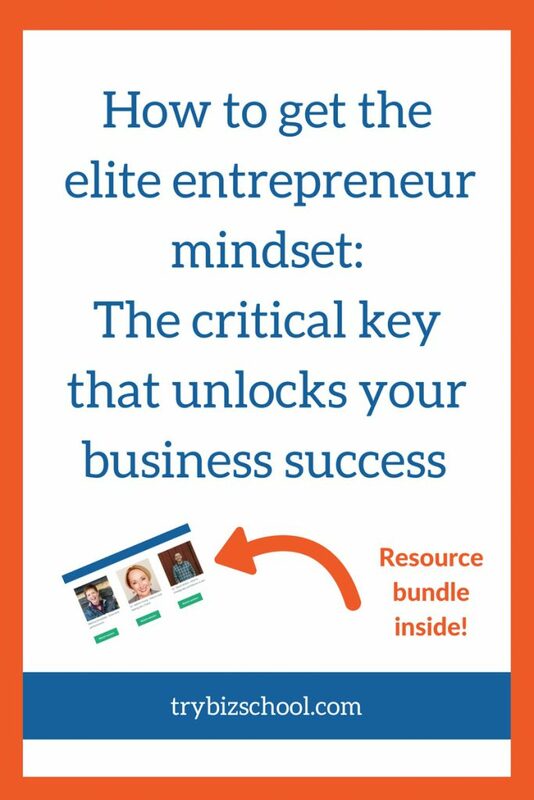 And I’ve also got a resource bundle for you that will give you further resources to help you get and keep your entrepreneur mindset in good working order. And I’ve also got a resource bundle for you that will give you further resources to help you get and keep your entrepreneur mindset in good working order. 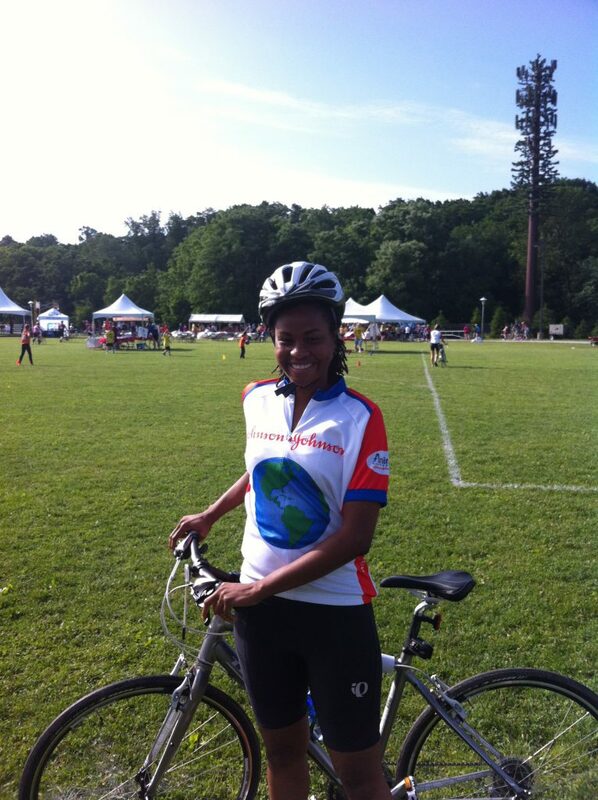 A few years ago, I did a 35-mile bike ride to raise money for the Juvenile Diabetes Research Foundation. Me just before the 35-mile ride. I was smiling because I was still naive about what the journey ahead had in store for me. When I got to the race early that morning I was ready. I was prepared. I was excited. And then the race started. At about halfway through, I arrived at the checkpoint where you could get snacks, water, and get minor adjustments to your bike. That’s when I figured out what my problem was. My tires needed air, and my bike needed a tune-up. My bike, the very engine I needed to complete the race was not up to par. Because this was my first fancy bike, the thought never occurred to me that I needed to get it tuned up before the race. Fail. And because the tires weren’t flat, I gave no attention to the potential need to get more air in them. Another fail. The nice gentlemen helping me filled my tires up to capacity and made some adjustments to my bike. When I started riding again I WAS AMAZED at how well it was operating. Since my bike wasn’t in top condition when the race started, everything was much harder than necessary. And if your mindset isn’t in top condition as you work to build your business, things will be harder for you too. Your mind is the engine of your business. If your engine isn’t working like the well-oiled machine that it is, you will struggle. You will struggle to get the important work you need to get done, done on a consistent basis. You will struggle to get other people to see your value. You will struggle to make the impact the people you are meant to serve are waiting for you to make. No bueno. No bueno at all. If you don’t take the time to get your mind right and develop the right entrepreneur mindset, your journey to building a business that thrives will be much harder than it needs to be. Just in case you were wondering, here’s how to know if your mindset could benefit from a tweak here and there. Unless you’re crashing and burning, you may not be sure if you’re thinking about and approaching your business like an elite entrepreneur. It’s tricky, because you can be doing work – the way I was with my bike, and be completely unaware that you’re making things harder than what they need to be. Here’s some telltale signs that your mindset needs some attention. What were the last 3 things you did in your life that at one time, you never imagined it was even possible? If it is a challenge to come up with a list of 3 things fairly quickly, then it is likely you are firmly planted within the confines of your comfort zone. Not pushing or stretching yourself to do anything beyond your current abilities. As an entrepreneur, you cannot afford to play it safe all the time. The environment around you changes far too rapidly, thus staying in your comfort zone is a risky strategy. If you find yourself consistently shying away from big opportunities, constantly waiting until you feel you’re “ready,” or making excuses about why now isn’t the time to make the changes you’ve been dreaming about, then it’s likely you need to reevaluate your mindset. It all boils down to fear. Fear of trying and falling on your face. Of being judged or ridiculed. And often, at a deeper level, there is a very present fear of succeeding. The people you serve need you to embrace your power and your ability to be extraordinary. They need you to stop playing small and go make the big impact you are more than capable of achieving. It doesn’t matter if you don’t feel ready. You will never feel 100% ready to do something. You’ve got to do things before you are ready. And get prepared as best as you can as you go. Being a perfectionist is often worn as a badge of honor. People think it means you have high standards and a commitment to excellence. In most instances, it just keeps you stuck and spinning. And it keeps you from putting good work out into the world. It keeps you in a state of always working, and never actually producing anything. Perfectionism is not your friend. In addition, who decides what the “perfect” standard is? Your customer’s opinion in this regard is the only one that counts, not yours. And if what you have to offer, in it’s current, “less than perfect state” enables you to make life better for the people you serve, then it is quite selfish of you to not give it to them, because it may not meet your ridiculously high standard. To be clear, the goal is to not put out shoddy work. Your goal is to put out quality every time. But instead of perfection, refocus your energy on continuous improvement in how well you meet or exceed your customers’ expectations. That’s a much saner, healthier way to operate. Growth is a sign that you’re doing something right. That you are serving your customers, and have your finger on the correct pulse of what they need and want most from you. When your growth happens at a snails pace, or if you aren’t growing, you’ve got to pause and evaluate what’s going on. You have to have a heart to heart with yourself as to what’s really going on and preventing you from moving forward. Is it that you’re not going after the big opportunities? Are you waiting for everything to come to you? Are you reluctant to change the current way you operate and try things that have been proven to work for others? All of these have an impact on your bottom line. So if you’re not making enough money, or if your results aren’t improving based upon what you’ve done previously, then my dear friend, it’s time to take a look inward. Peel back the layers to uncover what is really driving your actions, or lack thereof. Ok, now that you know what the symptoms are when you’re mindset needs a tune-up, let’s dive into the most common places that hold you back. Making the right changes in these areas will make a big impact on the way you operate and ultimately your business results. We’ve all felt fear at one point or another. Especially as you work to build something that makes a big difference. As such, you’ve got to get used to the idea that fear is going to show up. The goal isn’t to run from it, or try to ignore it. And it’s definitely not to let it stop you from moving forward. “How do I get rid of the fear? Alas, this is the wrong question. The only way to get rid of the fear is to stop doing things that might not work, to stop putting yourself out there, to stop doing work that matters. The first step in figuring out how to dance with your fear is to acknowledge what it is really trying to tell you. Is it warning you of some impending danger, like if you walk through this door you will fall off a cliff? Or you’ll get kidnapped? Or maybe there’s a hungry lion waiting to bite your head off if you disturb him? 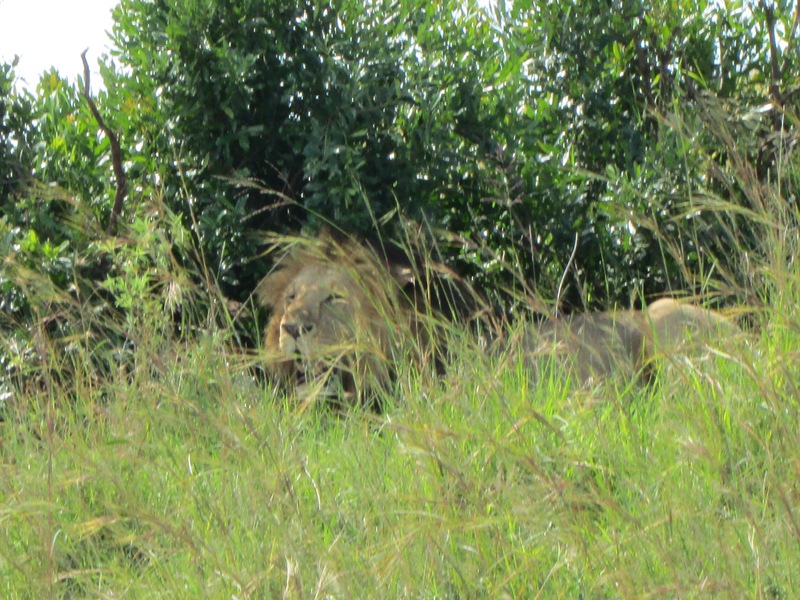 A lovely lion we came across while on safari in Kenya. As regal as he is, I definitely don’t want to get too close! When you evaluate the situation from an objective standpoint, you’re able to recognize the fear for what it really is. If it is warning you of real danger ahead, then take heed and proceed with caution. But if when look fear in the eyes you realize that it is not danger that it’s trying to warn you about, but just the uncomfortable feeling of stepping into uncharted territory, then this is when the game changes. You start to realize that this kind of fear will only serve to hold you back if you let it. But I don’t want to just tell you that you need to feel the fear (not danger) and do it anyway. There are specific strategies you can engage in that will help you address that fear head-on, so you can actually use it to your advantage. One of those strategies is called defensive pessimism, an approach that’s been proven in scientific studies to improve your performance. Usually, people try to run away from whatever situation makes you anxious. But there are other ways of dealing with it. Defensive pessimism is one way. When people are being defensively pessimistic, they set low expectations, but then they take the next step which is to think through in concrete and vivid ways what exactly might go wrong. What we’ve seen in the research is if they do this in a specific, vivid way, it helps them plan to avoid the disaster. They end up performing better than if they didn’t use the strategy. It helps them direct their anxiety toward productive activity. For instance, let’s say you know you want to start speaking publicly as a means to grow your business. When you feel the fear, stop and take note of all the possible bad things that can happen. That’d be a tough day for sure! Once you get clear on all the things you’re worried about, then make a plan for how to do everything in your power to prevent them from occurring. And because there are some things that are just beyond your control, prepare yourself to be able to handle it with ease if they do happen. That’s what helped 28-time Olympic medalist Michael Phelps be prepared to excel no matter the condition. During practice sessions, his coach would step on his goggles so he’d have to swim with his eyes closed, or he’d tell the car to pick him up late so he wouldn’t have time to eat before a swim meet. That preparation for sub-optimal conditions paid off, when his goggles did indeed fill up with water during an Olympic race. It didn’t phase Phelp’s a bit, because he knew exactly how to handle himself in that situation. Imagine every awful scenario that could happen, and then prepare yourself in advance to perform well in spite of it. Most people avoid failure like the plague. But you don’t have a magic crystal ball, so you can never be sure about how something is going to work out. You can have assumptions, and educated guesses, but failure is always a possible outcome. The rule is simple: The person who fails the most will win. If I fail more than you do, I will win. Because in order to keep failing, you’ve got to be good enough to keep playing. So, if you fail cataclysmically and never play again, you only fail once. But if you are always there shipping, putting your work into the world, creating and starting things, you will learn endless things. You will learn to see more accurately, you will learn the difference between a good idea and a bad idea and, most of all, you will keep producing. Ira Glass, host and producer of This American Life expressed a similar sentiment. You’ve got to keep producing. You’ve got to continue to put your work out into the world. And you’ve got to release yourself from the tyranny of perfectionism to allow yourself the permission to publish your work. Even when you know it isn’t the masterpiece you want it to be. Science supports this as well. Research from UC Davis professor Dean Simonton shows that your odds of producing breakthroughs increase exponentially the larger your body of work grows. The key is to stick with it. Learn from your failures. Learn about what didn’t work and take the key lessons to try again. That’s the approach James Dyson took in the 15 long years it took him to develop the vacuum design that would ultimately launch his billion dollar company. Each failure will teach you a lesson about what works and does not work. Each failure makes you better. Stronger. Smarter. More resilient. Just to be clear. Failure is not fun. So the way to keep your head in the game, so you don’t give up on the process while you’re figuring things out, is to detach your self-worth from the results. Lackluster product sales, losing a customer, or receiving a number of rejections does not mean you are a bad person, or that you are a failure in life. You cannot take these setbacks personally. How others respond to your work should have no bearing on the way you view yourself or your work. So keep shipping. Learn from whatever happens. Make adjustments. And then ship some more. And the last major part of dealing with your entrepreneur mindset is to address the vicious voice in your head that doesn’t want you to be great. That voice will cause you to second guess or dismiss everything good you’ve ever done. It will keep you from doing your work. It will cause you to not have confidence in your own abilities. And as you try to drown out that voice, you overcompensate by trying to be perfect, or by playing small. In his brilliant book The War of Art, Steven Pressfield discussed the force that causes these awful thoughts: the Resistance. Resistance’s goal is not to wound or disable. Resistance aims to kill. Its target is the epicenter of our being: our genius, our soul, the unique priceless gift we were put on earth to give and that no one else has but us. Resistance means business. When we fight it, we are in a war to the death. You are enough. Right now. In this moment. You are enough. That does not mean that you need to stay where you are and skip trying to improve. But it does mean that you are equipped to do your important work right now. Besides, feeling like a fraud kills your confidence. And confidence is essential to your success. In fact, studies show that your confidence in your abilities is more important than what you actually know. That’s what Katty Kay and Claire Shipman found in their research for their book The Confidence Code. So how do you build confidence? Turns out, it’s all about taking action. Confidence comes from doing. From consistency. From knowing that you’ve done the work and that you’ve prepared. It does not come from thinking about being confident. You must take action! Take a small step forward if you must. Focus on taking that one step forward. And then when you see you’re ok, take another. And then another. And then another. And finally, know this. Too often we do way too much thinking. But not the kind of useful thinking that helps you dominate and make a major impact in the beautiful world we live in. Your goal is to make life better for the people you serve in your business. So focus your energy outward. Focus it on your customers. Martin Luther King, Jr. covered this in his last speech before he died. In it, he talked about the parable of The Good Samaritan. The story goes that there was a man who was beaten and left for dead on the road. Many people saw him, but passed by and did nothing. The Good Samaritan saw him, and stopped to help him. He cleaned him up and took care of him until he was back in good health. When your thoughts are focused outward, there is no room in your mind to think about whether you are good enough. Your concern for making life better for your customers compels you to take action. But when your thoughts are focused on yourself, and how good or bad you think you are, the voices in your head, the Resistance takes over, which prevents you from doing what you need to do. Shut those voices down by reminding yourself that you are enough, and then focusing your energy on doing the work to serve your customers. Confidence, and success will flow naturally as a result. You already have everything within you to succeed. You just need to give your mind the tune-up that it needs so that you can step into the greatness the world needs you to create. Note, this is not something that you do one day and then it’s just fixed. It is a continuous process. Just like you have to get your oil changed in your car on a regular basis, you have to tend to your mindset regularly too. A well-oiled machine. That’s what you are. Make sure you keep your mind oiled. And then you can finally build the business we all know you are capable of. The business we need you to build. Don’t make it any harder than it needs to be. If you’d like additional resources to help you give you develop that elite entrepreneur mindset, grab this interview resource pack. It’s 3 masterclasses I’m unlocking from the vault of the course Entrepreneur Success Secrets: Masterclass Sessions. 1. Aiming too low… I good friend in LA said he always lives down to his lowest expectations. Some Native American wisdom: “It is better to aim for a star & hit a mountain than aim for an eagle & hit a rock”. And an African proverb: “It is better to shoot at a lion & miss than shoot at a jackal & kill it”. 2. I slosh around trying to get things perfect while lives I could impact in the mean time, wait & wait. No bueno! (as a wise woman says). I heard a new ago song called “The Perfect Flaw”. Is that not me? No more excuses. Go for it! 3. That photo of the lion! Kenya dig it? 4. Resistance. I just thought about that word, in my life & in the life of body-builders. They use resistance to build muscle. Hmmm, An affirmation I once thought up is, “I surrender resistance to the glory of my existence”. You can do it! Just keep going. Persevere, and you will see your way through.